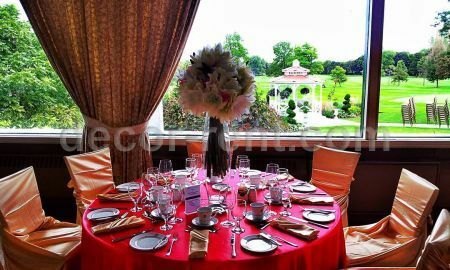 Offering wedding linen rentals Toronto, chair cover rentals, tablecloth and linen rental Toronto. Napkin rentals Toronto. Wedding event decor rentals & room draping. Custom wedding backdrops Toronto, Barrie, Oshawa, Pickering, Mississauga, Woodbridge, Brampton and Vaughan for over 18 years. SAVE ON WEDDING LINEN and CHAIR COVER RENTALS. We rent sheer, satin and velour drapes now. Wedding Decorators and wedding planners are welcomed. Take advantage of our packages and deals now for your 2019 wedding linen rental, chair cover and decor rentals. BOOK your appointment NOW to view our linen rental, chair cover and wedding decor rental collection. START your wedding planning NOW. Save NOW. Say NO to WEDDING STRESS LATER! WEDDING DECOR RENTAL TORONTO. CHAIR COVER AND TABLE LINEN RENTALS TORONTO. TABLECLOTH and NAPKIN RENTALS, BACKDROPS, ROOM DRAPING and MORE. We offer cheap rental prices for high quality rentals. THE BEST WEDDING DECOR, CHAIR COVER and LINEN RENTAL PACKAGES and DEALS in Toronto, Barrie, Scarborough, Oshawa, Pickering, Ajax, Markham, Richmond Hill, Mississauga, Woodbridge and other cities of GTA in Ontario. OUR CHAIR COVER and cheap LINEN RENTAL PRICES WILL SURPRISE YOU. CHECK OUR DEALS PAGE. SAVE NOW! We offer special rental DISCOUNTS for CHURCHES, FUNDRAISING and NON FOR PROFIT organizations. We provide chair cover and linen rentals for weddings, corporate events and galas, fundraisers, church gatherings, birthdays, bar mitzvah and bat mitzvah. We carry over 40 colors in our linen rental collection. 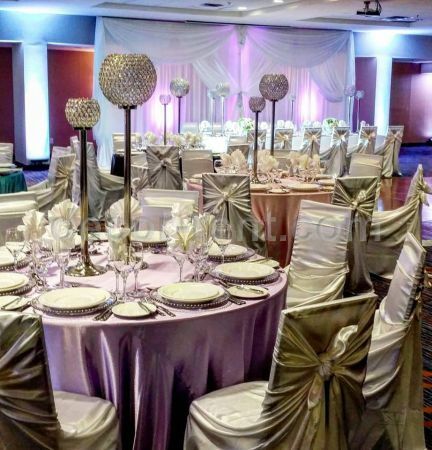 We offer cheap linen rentals in satin, sequin, brocade, taffeta, majestic, plain poly, organza and more. Napkin rentals are also available. Our linen rentals are available in Toronto and the GTA. All our linen rentals may be picked up from our office and warehouse in Vaughan (Concord), that is just 2 minutes North of Toronto. We also offer linen rental Toronto delivery service around the city and beyond. We have customers who come to get their linen rentals to us from Barrie, Oshawa, Pickering, Woodbridge, Brampton, Mississauga, Ajax, Markham, Richmond Hill, Newmarket and many more. We offer cheap linen rentals Toronto options for our clients for any event. Wedding linen rentals or corporate event linen rentals - we have your tables covers. We offer the best linen rental rates that you can find. All out tablecloth and linen rentals have matching linen napkin rentals available to complement your table setting. We carry a large inventory of chair cover rentals that are offered in plain scuba banquet chair covers, brocade chair covers, satin chair covers, spandex, stretch and damask chair covers. A large selection of chair sashes is also available. All our chair cover rentals same as our linen rentals are available for pick up or can be delivered to your banquet hall or event venue. We invite you to visit our wedding decor rental showroom to see our chair cover and linen rental inventory. We offer affordable wedding decor rentals Toronto prices. 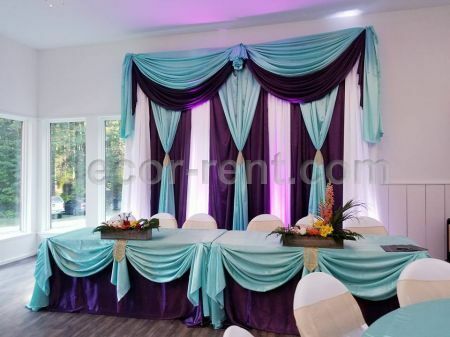 We offer Wedding decor rentals from DECOR-RENT include - wedding linen rentals Toronto, wedding backdrop rentals Toronto, wedding full room draping, wedding head table decor rentals, wedding arches and much more. We offer unique selection of custom wedding backdrop rentals. We offer wedding backdrop rentals for DIY and Full Service options. We are a full service wedding event decor rental company. We own a large, state of the art laundry facility where we process all our linen rentals, chair cover rentals and draping. We also offer commercial laundry service for hospitality industry. We wash linens, chair covers and draping for other rental and wedding decor rental companies. Wedding Decorators are welcomed. Affordable Chair Cover Rentals and Linen Rentals Toronto, Wedding decor rentals Toronto, Scarborough, Barrie, Mississauga, Oshawa, Pickering, Richmond Hill, Ajax, Markham, Newmarket.